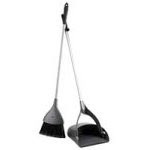 DigiCrumbs: Introducing my old friend the Broom and Dustpan. Introducing my old friend the Broom and Dustpan. Ok, so I told myself I would never use one of these again! This declaration came about back in college when all I had was an old tired broom to sweep the floors. I decided, then and there, it was goodbye broom, hello new vacuum cleaner as soon as I had a place of my own. Then along came my son. His biggest joy some days is dropping things to the floor. Yes, all sorts of things…but especially food from his highchair! He loves the cause and effect, but mostly the loud noise things make when they drop and go splat! On busy days, I try to keep the mess to a minimum, but often I just let him have at it. He gets the biggest smile and laughs hysterically as peas, apple chunks, diced chicken, and even his current favorite carrots (or anything orange for that matter) hit the floor. Really anything is fair game, he doesn’t discriminate! My lesson for today is Never Say Never! You never know what the future holds and here I am holding a broom and dustpan…again! I’m a big fan of my vacuum, so I’m not planning to ruin it anytime soon by sweeping up all those gooey, sticky messes. So I retract my statement and gladly welcome back my broom and dustpan. I must warn you broom, you’re in for a wild ride, but at least it will be filled with lots of laughs and maybe even an occasional round of applause from tiny, potentially gooey hands!